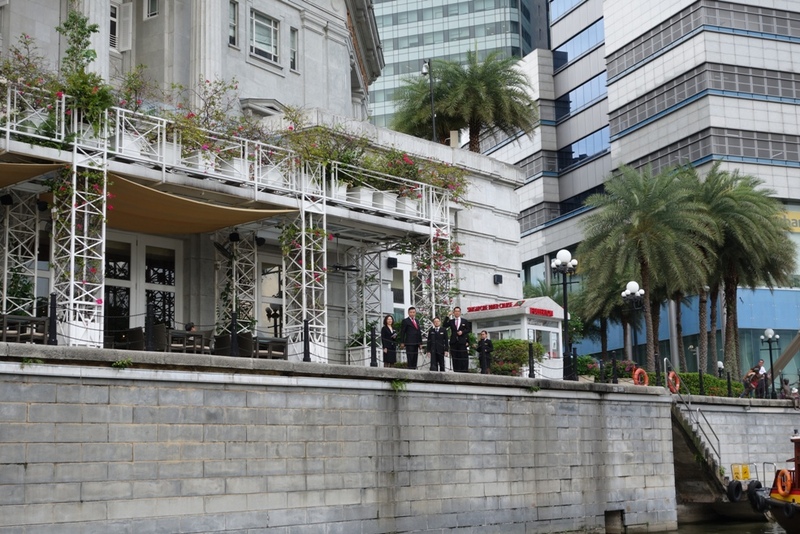 I have been waiting for many years for One On The Bund at the Fullerton Bay Hotel to close. The restaurant didn’t really ever take off, with indifferent food, ghastly furniture and an almost sacrilegious use of the special space it so undeservedly occupied – Clifford Pier. The latter is an 81-year-old landmark of old Singapore, which, if one was old enough to remember, conveyed hundreds of people onto bumboats and ferries to the outer islands of Singapore, whether for a holiday joyride and picnic, or to Kusu Island for the annual pilgrimage. It was a place suffused with good memories, in an earlier Singapore which had more soul and character than the slick, glossy city it is now. At peak season, Clifford Pier – hot, humid and definitely without air conditioning – was crowded as people jostled to get tickets, and walk the long jetty toward the waiting boats. There were a few vendors there, including a much loved kacang puteh man who sold his array of nuts in narrow paper cones. 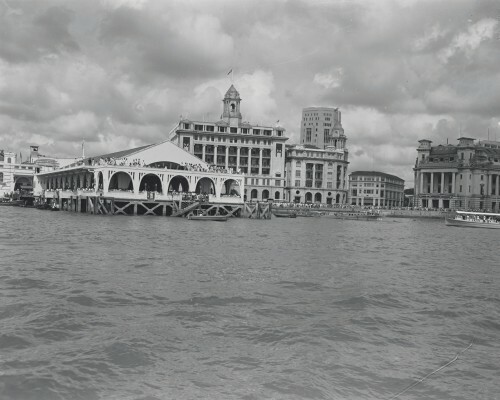 With the ‘modernisation’ of Singapore, Clifford Pier was closed, and the bum boats decommissioned. This lovely old building was eventually subsumed into the current and very new Fullerton Bay Hotel; but at least the developers kept the building intact. But from the hotel’s opening in the mid 2000s, this beautiful space was leased out to One on The Bund, a restaurant which didn’t seem to fully appreciate the significance of the space it occupied nor did a good job being a restaurant. What a waste of a fabulous space. Since then, I have been waiting for this day to come when the hotel is finally freed of this yoke, and able to turn Clifford Pier around and bring out its full potential. A couple weeks ago, the hotel launched The Clifford Pier to much fanfare, and I don’t think Clifford Pier has looked so stunning in ages. The launch party itself set the tone for the restaurant – even if a little contrived – which showed they fully appreciated the significance of this historical building. 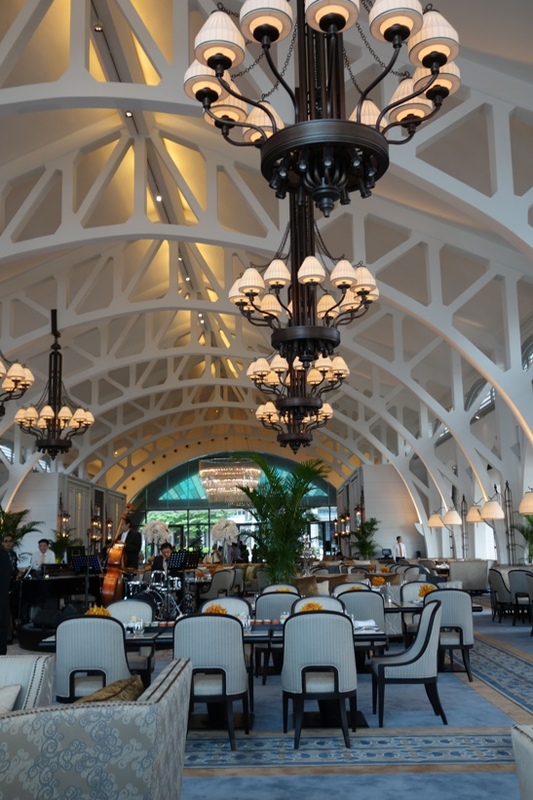 We first assembled in Town Restaurant at The Fullerton Hotel, another historical landmark and formerly Singapore’s General Post Office. 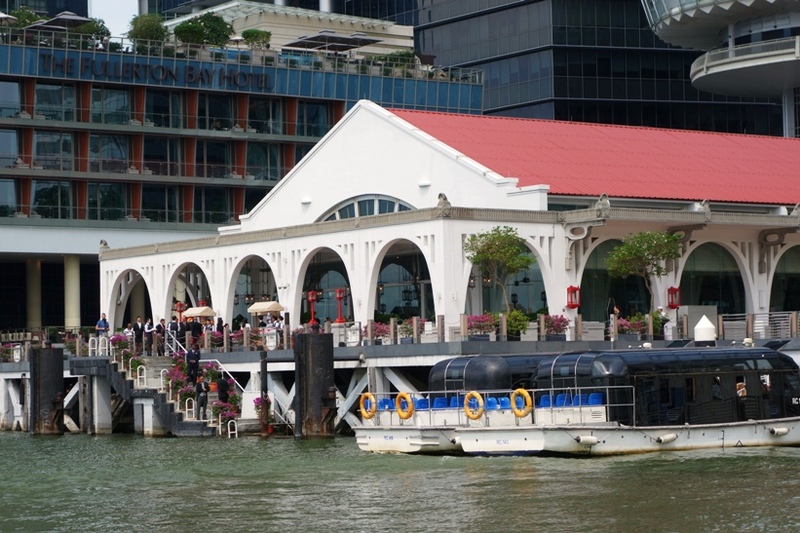 From there, we embarked on bumboats – the touristy kind – from its little private jetty down the Singapore River, rounding past Empress Place and the Merlion, then on to Clifford Pier. It’s such a treat to be disembarking there again after decades of lost memories. According to Chloe, the hotel’s Assistant Director of Marketing Communications, the ride was to give us “a taste of how the pioneers landed in Singapore” way back when. Of course, they weren’t seated quite so comfortably, then welcomed at the Pier with cold towels and iced bandung by hotel staff in suits. But we weren’t complaining. 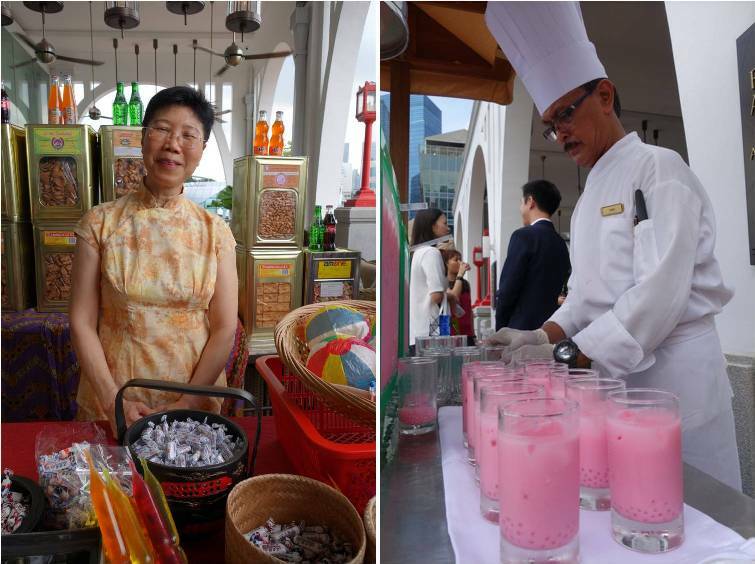 To add to the nostalgic 1960s atmosphere, the Fullerton Bay Hotel also set up stalls at the large front terrace of Clifford Pier with authentically old fashioned props – plastic drinks containers lined in green from where a chef ladled out pink bandung, dragon beard candy, ice cream with local bread coloured green and pink, and a cute stall laid out with local biscuits and old fashioned toys like paper balls and pick-up-sticks. Yes, those were only for the launch event but it was such a hoot. Inside, the huge Clifford Pier building was transformed into a stunning restaurant space, making use of its original high arched ceiling to dramatic effect. Huge chandeliers with maritime inspired chain-links are the visual focus which brought your eyes up to the vaulted white washed ceilings. Underneath plush carpets and bespoke furniture, low coffee tables, proper dining tables and plush seats give it a luxurious indulgent feel. Sit here and you’re in the lap of luxury, in a space is suffused with soft natural light from the arched windows – once open to the elements when it was the original pier. 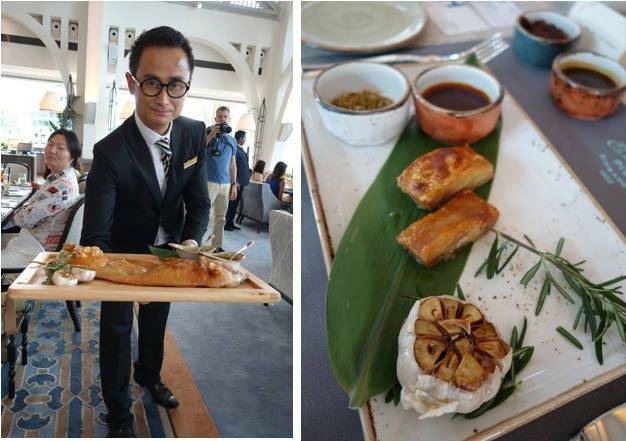 As the hotel’s new all-day dining restaurant though, the Clifford Pier plays up on local flavours – a tricky thing to succeed in doing here. You won’t come here all the way just for the food, let’s be honest. Char kway teow ($16), chai tow kway ($16) and laksa ($19). But see it as a full experience – with gorgeous historical setting and ensconced in prettiness – and it’s worth the occasional visit….particularly if you have foreign friends in town, or if you have something to celebrate. It would be such great fun to bring mum and dad here for a walk down memory lane too. Of course, we remember too that the surrounding area of old Clifford Pier and the Fullerton vicinity was a hub for hawkers, and until the mid 80s, you could get lots of good local street food in this area. The food at this new restaurant was pretty decent overall. 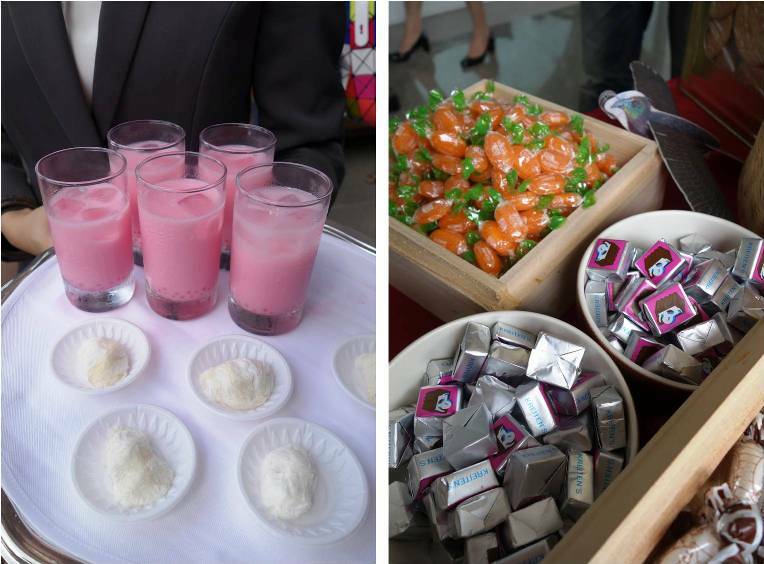 We started with kueh pie tee ($15 for 6 pcs), served on a platter where you assemble the components yourself. The bangkwang was not as finely sliced as it could be, and while pleasant enough, the flavour of the filling was not as deep and rich as if a traditional home cook made it. If it was a book, then this would be a good abridged version of a classic. 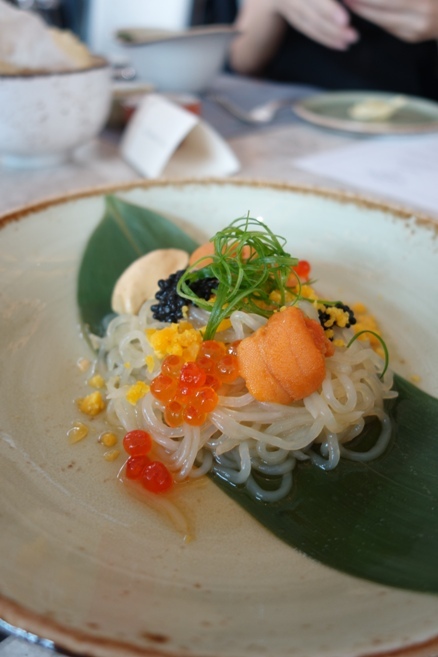 What stood out though was the positively unlocal uni glass noodles ($28) with sea urchin and salmon roe, salted egg, with lime dressing and truffles. Served at room temperature, this was a light, refreshing dish with soft, yielding textures and a whole lot of varying salty, sweet, piquant flavours, lifted by the hint of citrus. The truffles did nothing for me though, except perhaps to interrupt rather than counterpoint the high flavour notes. But this was good. Little wonder as the Chef Ken Zheng, who heads the restaurant at The Clifford Pier, is a Japanese trained chef. The crispy suckling pig ($38 per portion), was lovely too. Crisp, delicately crackling skin which yields moist, tender, sweet flesh, served with a sambal chilli sauce. Finally, there was what Chef Ken called Two Generations of Rickshaw Noodles comprising ban mian with simmered pork belly and soft boiled egg with runny yolk, and an accompaniment of a thickened clear broth with vegetables and some token yellow Hokkien noodles. 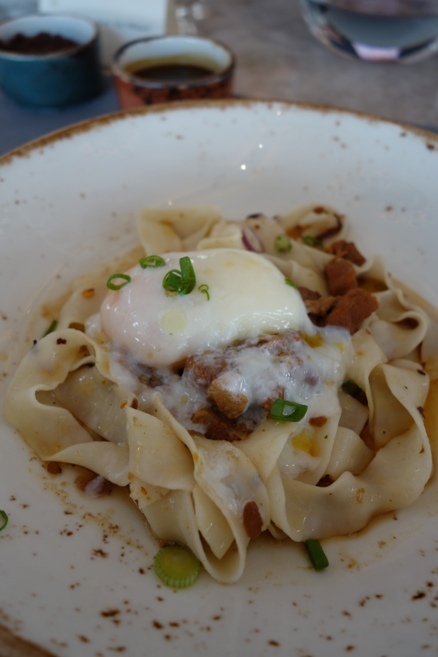 I rather liked Chef’s modern take on ban mian – tasty, springy noodles with soy braised pork and enriched with runny egg, done like a pasta dish. 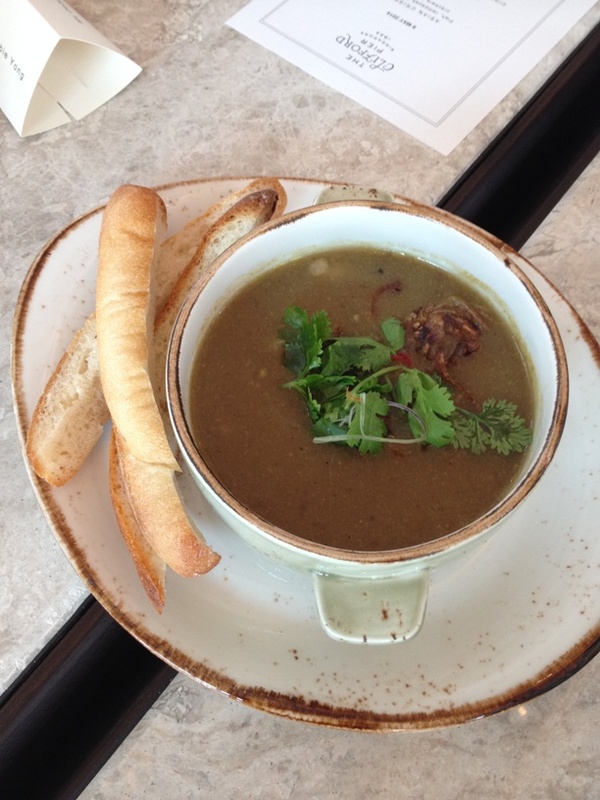 The soup on the side was simple but tasty and filling. Why such an odd combination? There’s a story behind this. Chef Ken’s grandfather was an itinerant hawker who stationed himself at Clifford Pier all the way up to the early ‘80s, selling a simple dish of soup noodles. “The workers and trishaw riders would come by, grab a quick meal of the noodles and push on,” he said. As a preschooler, he remembered tagging along with Grandpa and helping him wash the bowls. 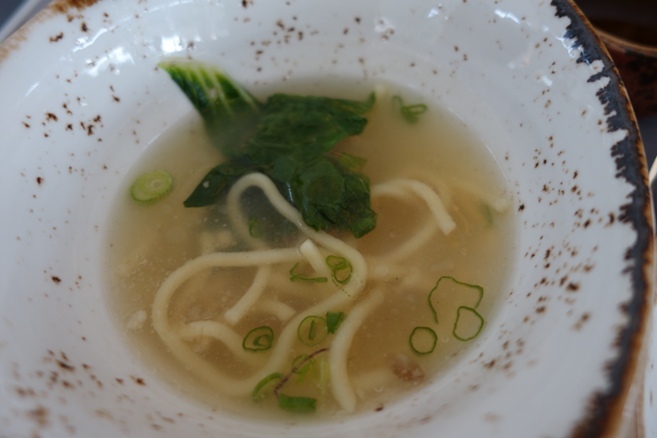 Now as a professional chef, he has taken the opportunity to revive his grandfather’s dish in a fitting tribute, but also complementing it with his own creation, a modern take on traditional ban mian. I thought that was pretty clever and very touching too. The menu is predominantly local with other dishes like kong bak bao using Iberico pork belly. But being a hotel restaurant, there are a few international options too, like kimchi fried rice, burgers and salads to cater to other tastes. The dessert menu holds lots of wicked temptations. The Hong Kong Dai Pai Dong French Toast drizzled with condensed milk & a side of peanut butter ice cream, and Teh Tarik Ice Cream with honeycomb crunch ($9) are creative dishes which make use of very local and Asian components; while the Baba au Rum, a retro favourite, is updated with macerated berries & chantilly cream ($15). 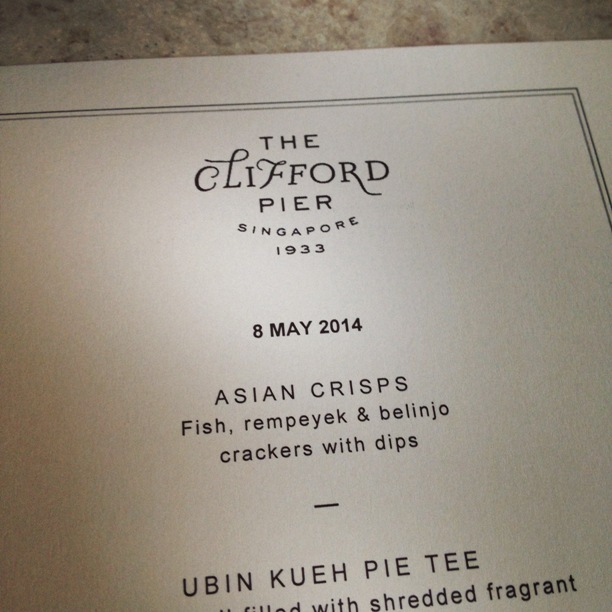 The Clifford Pier also has a supper menu too with the likes of oyster omelette and Teochew porridge. While I do say it’s tricky to pull of the local food concept in this beautiful new restaurant, I seriously hope they succeed. Because if you think about it, would you have any other cuisine being the main focus at this historical, iconic grand old dame? I didn’t think so….